Looking for a great way to raise money for your school, church, sports organization or charity? Have we got a deal for you... sell our Shammy Shine Car Washes Gift Cards at face value and earn a 30% commission! Shammy Shine Car Washes will provide your organization with $10 or $20 Gift Cards which your volunteers sell for face value. We will pay you a 30% commission on each card sold. We are happy to support Non-Profit Organizations in our service areas to helping you achieve your fund raising goal. Shammy Shine Car Washes Gift Cards are convenient to use and may be used to purchase any of our products or services (except gasoline) at any of our New Jersey or Pennsylvania locations. Shammy Shine Car Washes makes holding a Fund Raising event easy! We provide the information sheets, sign up sheets, and the Shammy Shine Gift Cards. All you need to do is treat them like cash, sell them for face value and keep 30% for your organization. Consider the many environmental, safety, and financial benefits of working with Shammy Shine Car Washes for your fund raising event instead of hosting a parking lot hand wash.
Shopping Center and School Yard car washes are being discouraged by many states and communities because they pollute the local storm system with soap phosphorous and other contaminants that run into the watershed. In many environmentally conscious communities independent fund raising car washes must clean vehicles with water only and are prohibited from using any type of soap or wax products. Shammy Shine Car Washes uses only environmentally safe soaps and waxes that are approved by the United States Car Wash Association. We reclaim, filter, and sterilize our wash water for reuse. This significantly reduces the amount of water we use and really makes environmentalists smile! Washing vehicles with a hose and bucket wastes up to five times the water that Shammy Shine Car Washes use when washing a vehicle. Working together we can conserve one of our most precious resources – water. Damage to vehicles, personal injury to a member of your organization, or injury to one of your supporters are all possibilities you must consider when you run an independent fund raising car wash event. Shammy Shine Car Washes assumes the wash site risks for damage or injury when we work together on your fund raising car wash project. What could be simpler or safer for your Organization? 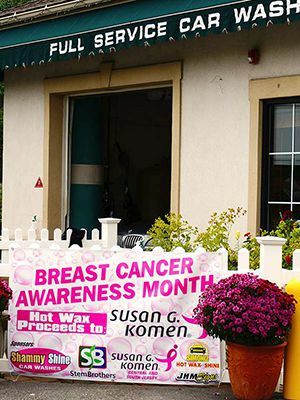 International Carwash Association members, such as Shammy Shine Car Washes, have been helping local organizations raise funds through car wash sales all over the U.S. for many years. We're experienced and we know how to help you run a successful program. Income is divided. The your organization receives a 30% commission on all proceeds from your sales to contributors. Shammy Shine Car Washes receives the remainder to cover our costs for supplies, labor, and other expenses. Charities, team organizations, schools, church groups, and other fund raising organizations typically raise far more money by working with Shammy Shine Car Washes than they can by going it alone. Why? Shammy Shine Car Washes assists you in offering a service that people in our community already know about, value and regularly use. 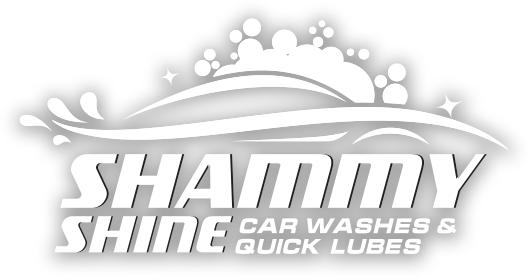 The Shammy Shine Gift Cards are easy to sell because you are selling the services of a professional car wash and may be used for any Shammy Shine service or product except gasoline. When your supporters buy wash tickets from your organization, they are supporting your activities, and they are getting a great car wash, quick lube or auto accessories too!